You can build on MAN. MAN Truck & Bus is showcasing a broad range of exhibits and integrated solutions in order to demonstrate its expertise in the construction sector at bauma 2016 which is the world’s leading trade fair for experts who deal with construction and building-material machines, construction vehicles, equipment and mining machines. bauma is taking place in Munich from 11th – 17th April 2016. Since the Middle East construction sector is a significant source of demand for the region’s commercial vehicle industry, MAN Truck & Bus is using bauma as a platform to reinforce its focus on the Middle East construction industry and strengthen relationships with its distributors across the region. MAN will present its latest construction solutions in light, medium and heavy range in hall B4, stand 225. The display on the stand will include a MAN TGS designed for 33 tonnes for the mining industry, a two-axle MAN TGS as a semitrailer tractor, a payload optimized truck mixer on a four-axle MAN TGS, a three-axle MAN TGX tip-per, and a crane tipper from the TGL series. Five other vehicles will also be located in an open space in front of hall B4 at the exit next to the stand. The focus of the MAN product range is on the needs of the user – true to the trade fair motto, “You can build on MAN.” MAN's sector-specific focus can be seen in many areas, for example in the choice of two possible all-wheel drive technology designs available for MAN trucks in the Middle East region. The optional all-wheel drive is the first choice for occasional driving on more challenging terrain. The permanent all-wheel drive is ideal for applications where a high-level of traction is often required and where there is wide variation in road holding conditions. 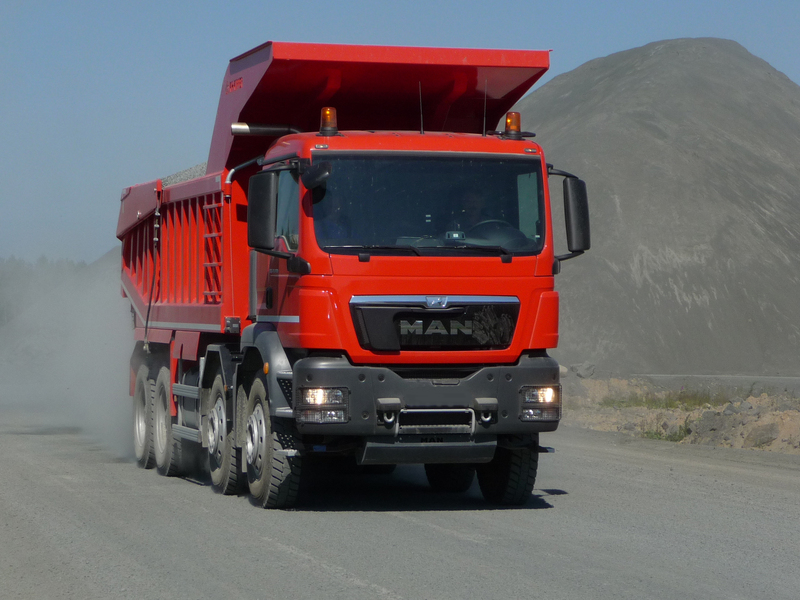 For the construction industry, MAN offers the tough and resilient MAN TGS chassis from its WorldWide product family. The vehicles are optimised to meet sector re-quirements: The tandem axle unit on the MAN TGS 33.480 6x6 BB exhibited at bau-ma has a longer wheelbase of 1500 millimetres. This means that large format 16 R 20 tyres can be fitted. For extremely challenging ground conditions, 24 R 20.5 tyres can also be fitted to the rear axle. The MAN TGS dumper truck, designed for a gross permitted weight of 33 tonnes, is therefore ideal as an alternative to specialist vehicles such as the articulated dumper which is significantly more expensive to purchase. The MAN TGS WorldWide is a truck for tackling and dealing with extreme challenges. These include challenging road conditions and extreme climatic conditions. The MAN TGS 40.540 6x6 BBS from the TGS WorldWide series is avail-able for the toughest of transportation tasks. The combination of the three-axle tow-ing vehicle with 540 hp engine, MAN TipMatic automated gearbox with converter-clutch unit , leaf-sprung planetary axle and additional radiators for engine, gearbox and transfer case is ideal for gross train weights of up to 250 tonnes at maximum traction. The variant range includes left and right-hand drive vehicles and is available in emission categories Euro 4 and Euro 5. The Euro 5 exhaust classification is increasingly gaining in importance in markets outside Europe. MAN is therefore introducing common rail engines from the D20 and D26 series for the first time to the TGS Worldwide series in this exhaust classi-fication. These come from the D20 engine series with 320, 360, 400, and 440 hp. The D26 covers the 480 hp and 540 hp versions. All the engines are 6 cylinder in-line engines. For the first time at a construction trade fair, MAN will present the updates made to its entire TGS and TGX series engine portfolio. Top Torque, the electronic torque enhancer, is a new fuel saving technology and has been added to all D26 engines. The engine’s power train manager provides increased torque of 200Nm in both the higher 11th and 12th gears. Thanks to the higher pulling power, the driver is able to drive for longer in the higher gears. This saves changing down the gears and reduc-es tractive force interruption on slight inclines. This results in positive effects on transport efficiency including reduced fuel consumption, increased average speeds and improved driving comfort. The MAN Service and Business Solutions areas will also be represented with five information islands on the MAN stand. Aftersales are represented focusing on the themes of MAN Genuine Parts® ecoline and engine repair kits as well as the areas and themes of Advanced Body Builder Interface (ABBI), Trucks to go worldwide, MAN ProfiDrive, MAN TeleMatics, MAN ServiceContracts and MAN Card and also MAN Financial Services. The latter will deal with issues regarding finance, leasing, rental and insurance.